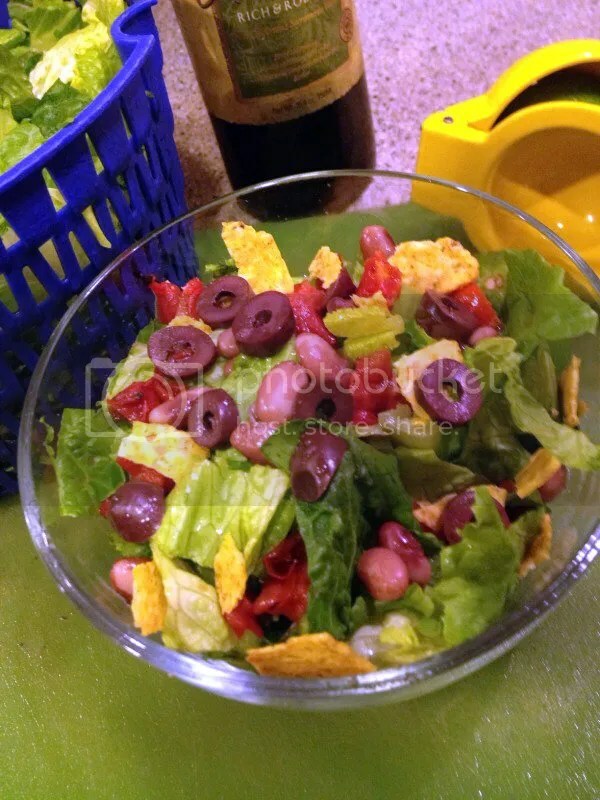 Red beans add a delicious warmth to this salad. Note that I substituted yellow corn chips since I had no corn in my freezer pantry. I’m just giving an ingredient listing; use amounts that best suit your household size and tastes. Lettuce: A sturdier green, like Romaine, green leaf lettuce or bunch spinach will do the best job of holding up the heavier mix-ins. Canned Tomatoes: As always, use a high-quality brand for best flavor, like Muir Glen. So they don’t make the salad soggy, dice them, remove seeds and then drain well in a colander before adding to the salad. Fire-roasted tomatoes are a nice addition. Corn: For best results, remove from the freezer in the morning and thaw in the frig in a colander all day. Otherwise, just microwave 1-2 minutes and drain, or place in a colander, rinse with hot water and drain well before adding to salad. Rice: For a heartier salad yet, add a little warm brown rice. Fast Version: Simply add the cumin and chili flakes (noted below) to 1/4 to 1/2 cup readymade Italian dressing. Homemade Version: Combine in the order given in a small, lidded jar. Shake well to combine. Allow to sit for at least 10-15 minutes for flavors to meld.